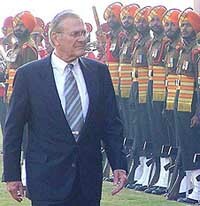 The Indian leadership today told the visiting US Defence Secretary, Mr Donald Rumsfeld, that the American arms sales to Pakistan could impact the positive sentiment and goodwill for the USA in India. However, India did not seek a review of the US decision nor did any suo motu assurance to this effect come from Mr Rumsfeld, sources said. Should it be compulsory for every government servant to work in rural areas? The NDA today decided to continue to press with its demand in the Lok Sabha for the Prime Minister’s statement on the spat between two Cabinet Ministers, Mr Laloo Prasad and Mr Ram Vilas Paswan. The Tamil Nadu police rounded off a busy day getting the judicial remand of Shankaracharya Jayendra Saraswati extended for another 14 days till December 23. 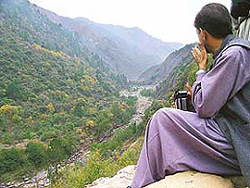 Does people-to-people contact between India and Pakistan help the peace process? 29-C, Chandigarh, with 'Forum' superscribed on the envelope. The Supreme Court is understood to have sought the consent of four Judges of the Punjab and Haryana High Court for posting them to other High Courts. There has been a spurt in the number of custodial deaths in Punjab with 87 cases being reported to the Punjab State Human Rights Commission this year till November 30. The disposal rate by the commission seems to be poor with only 32 cases being disposed off. The government has advised the BCCI to go ahead with the matches in Chittagong on the basis of its security team’s report, Ministry of External Affairs spokesman Navtej Sarna announced today. The curtains came down on a vibrant and happening 35th International Film Festival of India here tonight with the Iranian film “Beautiful City” (Shar-e-Ziba) winning not only the Golden Peacock and a Rs 5-lakh prize for the best film by an Asian director (Asghar Farhadi) but also a Rs 2.5-lakh special jury award for the actor Faramarz Gharibian.